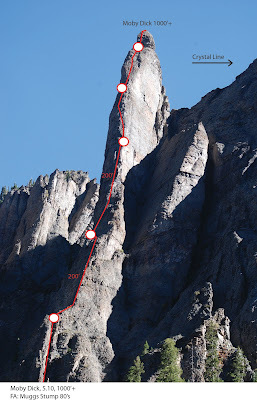 This September Steve Johnson and I headed up to establish a new route on the prominent tower to the left of Ingram Falls (above Telluride’s Via Ferratta) only to discover that the “plum line” (right up the buttress of the tower) had been climbed. There were anchors every 200’. We did a little investigating and discovered that Mugs Stump (et.al.?) established this route in the mid to late 80’s (when he came back into town after having climbed the tower and “told fellow climber that he had just put up a new route high up at the end of the valley”. No one then really understood where, or so it seemed, at the time the exact location of what he was talking abut. (Though I am sure someone did, it never made it into any of the guidebooks etc—not that it really matters). In any event, the route is 1000’+, 5.10a/b R, and has a lot of loose rock all over it—a classic alpine rock climb to be sure. It protects “ok” in places with wires and nuts—bring a double set, some cams are handy too, and wide stuff for the top. See photo. More can be done here—and will be soon. UPDATE: I'm pretty sure this line was climbed by James Williamson and Bob Dergay in the early 2000's. When they did it they described it as the plumb line up the prominent tower below ajax with poor pro and anchors every 200'. I've got an email with the topo sent to Bob to see if he can verify. Might be good to know the FA info for historical accuracy. I'll let you know if I get any conclusive reports.